Beware the bucket! 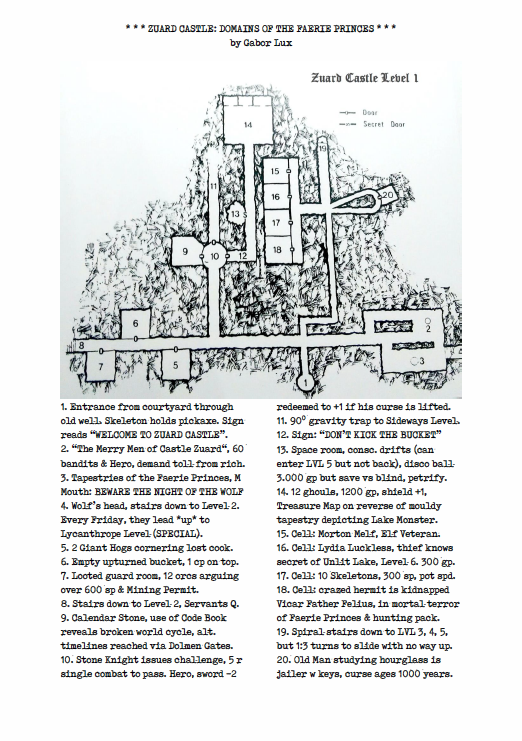 This dungeon level was created in response to Jon Salway's challenge to reimagine the Dungeon of the Ground Goblins with a minimal OD&D key. There will no doubt be many entries, but this is mine, created in a quiet hour on a rainy afternoon. The main challenge was to make it all fit in a typewriter font, and with a little nudging, it worked out. There are traces of both the original and Paul Cook's revision in there, and references to dungeon levels and puzzles you will never see (probably). It is probably a bit heavier on flavoured encounters than a real OD&D megadungeon would be, and way more densely packed, but them's the breaks.